Now I know I'm mostly the baking type, but today you are gonna be so #blessed to drool over this flatbread pizza that I made up. I got this idea after having dinner with a friend in the area and we split a veggie flatbread (which is very unlike me to get veggie anything) but our waiter totally sold us on it. 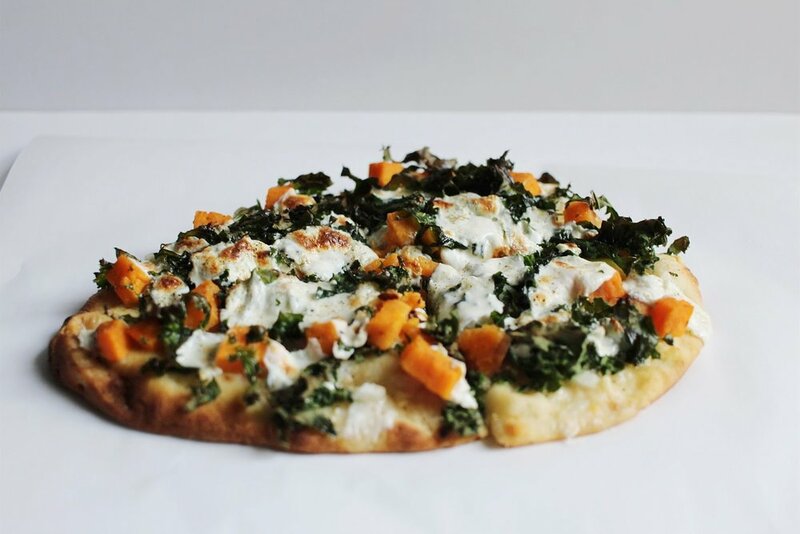 He said it had bits of pumpkin and kale, and the flavor was really amazing... and even though he preferred meaty pizzas, this one had a special place in his heart. I guess we were feeling daring, so we agreed to give it a try. From then on, that flatbread branded a little spot in my heart too. So being a doting wife, I set out to recreate it for my husband one night before he got home from work. There are seemingly many ingredients, but none of them cost much and you only need a little of each. I consider this flatbread to be healthy, but considering my meat-and-potatoes husband requests this, I feel like maybe I'm fooling myself. I'll let some health nut be the judge of its nutritious value. This looks really labor intensive, but I promise it's not.. just some chopping, but it goes fast because you only need a portion of each item. To save even more time, I use chopped garlic from a jar! This is seriously so flavorful and delicious. You could add or subtract anything you want. We've added sesame seeds in the past, which was good, and I sort of want to add bacon one of these times too (making it not-veggie haha). If you give this a try, let me know what you think! Preheat oven according to flatbread package instructions. Mine says 400. Bring a small pot of water to a boil and let your sweet potato rounds cook. About 7-10 minutes. While the potatoes are cooking, chop the onion, garlic, pistachios, and kale. Cube the mozzarella and avocado. When the potatoes are done (can easily be pierced through with a fork), strain the water and let them cool briefly. Then cube them. Set all aside. 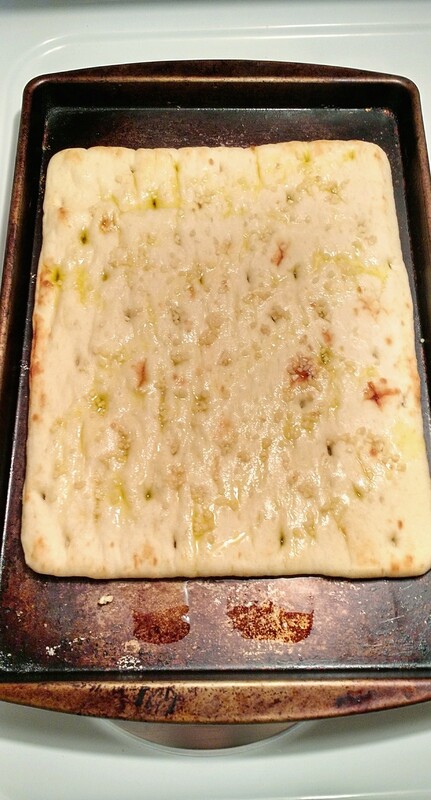 On a cookie sheet (or whatever baking pan you have) place the flatbreads. Add the chopped garlic evenly over the top. Add potatoes, onion, avocado, kale, and pistachios evenly across the flatbread. Add mozzarella. The flatbread should look quite "full." Drizzle a little olive oil, and sprinkle lightly with salt, pepper, and basil. Bake according to package directions, about 15 minutes. Turn oven to broil for 1-5 minutes at the end.